A strange comedy that is often more cringe inducing than funny as Martin short plays a boy and tortures his host family. I never really saw the problem child movies, but I imagine they were something like this. Movies about a kid who caused all sorts of trouble, doing terrible things to the adults, presented with a light-hearted and silly tone. That’s not to say that the movie was funny, but that it thought it was. This kind of storyline, played as a comedy. There are two other movies that also come to mind, besides problem child, and both coincidentally starred Macaulay Culkin, the child actor who everybody loved back in the early nineties. The first movie is home alone. There he tortured some common neighborhood burglars and we cheered for him every minute of the way, because they were bad guys. That movie really did work as a comedy because the villains got what they deserved. But here, in Clifford, where Martin short’s character (a kid named Clifford), tortures his uncle, (Charles Grodin,) we don’t cheer in the same manner. That’s because Grodin’s character, uncle Martin, is not a villain. He’s a nice guy just trying to get by. The other movie is the good son. In that film, Culkin plays a boy who again tortures people. He not only tortures the adults in his life, but also anybody around him. He plays an evil character and the movie treats the material as a psychological thriller. Now granted the things he does are a little worse than what Clifford does here (Culkin actually causes people to die), but Clifford does some pretty terrible things too. He constructs an elaborate setup, for example, of having his uncle make a taped confession of a bomb threat. He also blows up his uncle’s model at a presentation, causing his uncle to get fired from his job. The difference is that the good son knew this material wasn’t comedic, whereas Clifford never really acknowledges that at all. Now some of the movie is funny. With all of the things this menace does, sooner or later some of it would have to be. But overall, the plot of the movie seems creepier than anything else. Just the initial premise of having Martin short, an adult man, play a little kid, is bizarre as it is. It’s funny, I suppose, but it’s also very strange. His head is superimposed for the entirety of the film, onto a child’s body. And that’s about as original as this movie gets. I also liked the way Clifford came to live with uncle Martin, as Martin was using Clifford to help resolve a fight he was having with his girlfriend, Sarah (Mary Steenburgen.) Martin buys a house on a cliff and is really excited about moving in there with Sarah. The only problem is, the house is in no way conducive to having a kid. there is only one bedroom, and the proximity to the cliff makes it a very dangerous location. Sarah takes all of this to mean that Martin has no interest in having children. he tried to assure her that she’s wrong, but it’s no use. he needs to somehow prove it. and then he gets the call from his brother, (Richard kind), asking if Clifford can come and stay there with him for about a week. uncle Martin was just talking about Clifford, telling Sarah all about his nephew and how much he loves him, trying to show her that he really does love kids. having Clifford stay for the week will be his real chance. 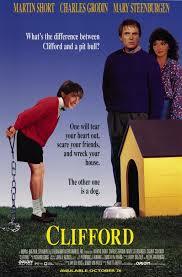 I like the way the movie shows us both Clifford’s story and also the uncle’s story separately at first. we are with Clifford and his family on a plane, as Clifford goes into the cockpit to see the captain, messes a few things up, and causes the plane to make an emergency landing. he’s not allowed to fly, and yet his parents need to get somewhere. that’s the problem. the solution is to ring up uncle Martin and ask for a favor. and I like how we then get to watch Martin dealing with his problem, before Clifford ever even comes to stay. it is worth noting that one of the funniest scenes in the movie involving Martin (maybe even the funniest), has him dealing with Sarah, when Clifford is not even there. that’s because the Clifford character is not all that funny. he’s more annoying than anything else. but Charles Grodin is a comedic genius and he does what he can for this movie. there’s a pretty funny moment later on when Clifford tells his uncle bad things that people said about him and the uncle believes it. Clifford tells him that Sarah’s father is the one who put lipstick in his uncle’s pocket because he wanted to see uncle Martin look like a fool. I love that Martin kind of buys it. the problem of the movie starts when uncle Martin that he will be taken to Dino-land, an amusement park, promises Clifford filled with Dinosaur rides. this is Clifford’s one and only desire throughout the course of the film, and when his uncle promises it, Clifford subtly warns his uncle of what will happen if the promise is broken. when something comes up and the Dino-land plan falls apart, Clifford is suddenly out for vengeance. in a very predictable manner, Dino-land is talked about throughout the entire film, but held off until the ending. it’s used for the climax the same way a high school movie would save the senior prom for the end of movie climactic scene. the problem is that we see that coming a mile away, and so when the movie does end there, it isn’t nearly as cool or exciting as it should have been. the movie is sometimes funny, but more often not. the plot is nothing special at all, and for the most part, we aren’t laughing but cringing. this isn’t feel good comedy at all. it’s a watchable movie with a couple of things going right for it, but mostly it’s just a dud.